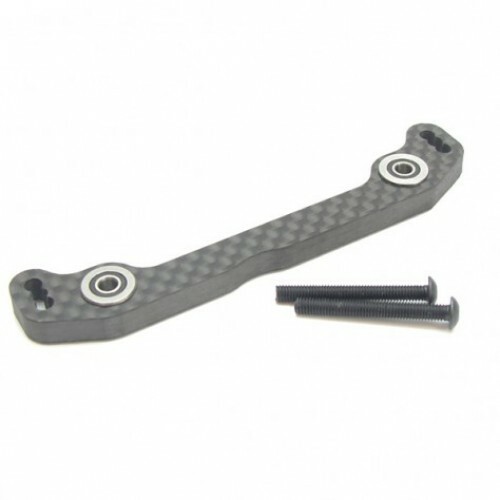 Designed to replace the standard alloy Ackerman plate, the Carbon RC JQ Ackerman Plate is a great upgrade for your Black or Grey Edition JQ. With 4 flanged bearings (2 each side) and made from 5mm Carbon fibre for strength these plates are designed to last. The aim of this upgrade is to prevent build up of slop in the steering on both the Black Edition and the Grey Edition. Price is for one plate supplied with 4 bearings and 2 x 25mm Button head screws to replace the existing countersunk screws. Fitting tip: When screwing the retaining screws we would suggest screw until you feel the assembly clamp then back off to ensure no friction but not so much that there is excess float in the assembly.